Izturis with the St. Louis Cardinals on September 9, 2008. César David Izturis (/ɪsˈtʊərɪs/; born February 10, 1980) is a Venezuelan former professional baseball shortstop. He is the half-brother of shortstop Maicer Izturis. Signed by the Toronto Blue Jays as an amateur free agent in 1996, Izturis made his debut with Toronto in 2001 and was traded to the Los Angeles Dodgers at the end of the season. Coming from a long tradition of Venezuelan shortstops, which includes Chico Carrasquel, Luis Aparicio, Dave Concepción, Ozzie Guillén, Omar Vizquel, Álex González and Carlos Guillén, Izturis has the defensive skills to rank in such distinguished company. After showing some hitting potential with a .269 average in his rookie season with Toronto, the Dodgers were enthusiastic to trade for him. Izturis was designated as the everyday starting shortstop from Opening Day of the 2002 season, and he quickly established himself in the Dodgers' infield. But he showed no patience at the plate, resulting in a decline in average and very few walks. After two years of barely adequate hitting (though compensated by his stellar glovework), he improved markedly in 2004, when he hit .288 with 62 RBI and 25 stolen bases in 159 games. At the end of the season, he earned his first Gold Glove, the first by a Dodger shortstop since Maury Wills' back-to-back honors in 1961 and 1962. In 2005, Izturis hit .348 through June 1 and led the entire majors in hits. He was selected for the National League All-Star team, but his batting average later dipped all the way down into the .250 range. Curiously, his defense also seemed to suffer. After two trips to the disabled list, Izturis underwent Tommy John surgery in his right elbow, and returned in mid-June, 2006. With the uncertainty around Izturis, the Dodgers acquired shortstop Rafael Furcal in the off-season. That move seemed to have put Izturis' future with the Dodgers in doubt. With a $13 million annual salary, Furcal did not seem a likely candidate to be benched. At the 2006 trade deadline, Izturis was traded to the Chicago Cubs for Greg Maddux and cash considerations. On July 19, 2007, Izturis and cash were traded to the Pittsburgh Pirates for a player to be named later. On November 16, 2007, the Pirates declined an option on Izturis, and he became a free agent. Shortly thereafter on November 30, 2007, Izturis signed a one-year, $2.85 million deal with the St. Louis Cardinals. In 2009, he led all starting shortstops in range factor, at 4.89. On December 10, 2010, Izturis re-signed with the Baltimore Orioles to a 1-year contract. On December 21, 2011 he signed a minor league contract with the Milwaukee Brewers. He also received an invitation to spring training. On March 29, 2012, Izturis was added to the Major League 25-man roster by the Brewers. On August 6, 2012, the Washington Nationals claimed Izturis off waivers from the Brewers. He was designated for assignment by the Washington Nationals on August 17, only 11 days after arriving in Washington. On August 20, 2012, he was granted free agency. On January 14, 2013, the Cincinnati Reds announced that they had signed Izturis to a minor league contract with an invitation to major league spring training. The Reds selected the contract of Izturis on March 31. Izturis signed a minor league deal with the Houston Astros on January 14, 2014. He was released on March 24. Izturis resides in Barquisimeto, Venezuela in the offseason with his wife Liliana and their two children; his son Daniel (born 11-11-1999) and daughter Daniella (born 7-17-2006). In 2016, Daniel signed with the Mariners as an international free agent. ↑ Wagner, Greg (June 29, 2006). "Izturis brothers feel no rivalry". MLB.com. Retrieved May 4, 2010. ↑ Strauss, Joe (December 1, 2007). "Izturis deal nudges out Eckstein". St. Louis Post-Dispatch. Retrieved December 1, 2007. ↑ Ginsburg, David (10 December 2010). "Orioles, SS Izturis agree to $1.5M, 1-year deal". Washington Post. Associated Press. Retrieved 2010-12-11. ↑ Gleeman, Aaron (January 14, 2013). "Reds sign Cesar Izturis to minor league deal". Retrieved January 14, 2013. ↑ "Cesar Izturis News: The Reds purchased Izturis' contract from Triple-A Louisville on Sunday, MLB.com reports". March 31, 2013. Retrieved August 20, 2013. 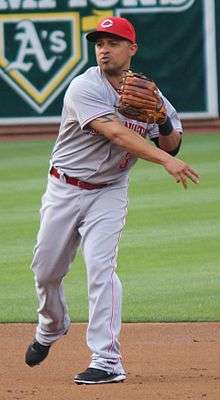 Wikimedia Commons has media related to César Izturis.